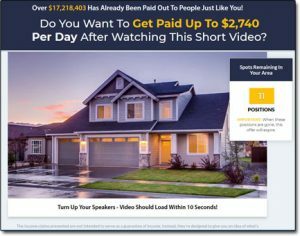 Is The Secret Millionaire Training System a Scam? My Review Reveals All! But you might be thinking it all sounds a bit too good to be true, and to be honest I agree… So what’s the deal? Is it actually legit & can you make money with it, or is the Secret Millionaire Training system a scam that’ll just part you with your cash? What Exactly Is the Secret Millionaire Training System? The website tells you that you can make as much as $2,740 per day, which I think you’ll agree is an awful lot of money. Funnily enough that is the exact amount required to see you earning $1 million in a year… So this system supposedly makes out like it is going to make you a millionaire in exactly 365 days. It’s funny because I actually recently wrote a blog post on how you can make a million online in a year – so yes, it is possible to do it, but the likelihood is that you are not going to be able to do it with the Secret Millionaire Training system. Well simply because the so-called Secret Millionaire Training system isn’t quite what it seems. It’s actually not a system in itself at all, it’s just a sales page that’s been put together to get you to buy into something called Jeff’s 6 Figure Business System. How Does The Secret Millionaire Training System Work? Despite all of it’s crazy income claims the Secret Millionaire Training website actually contains little substance. Just a video, an income disclaimer & a button that will charge you $49 to get started. The thing is that if you hit this button & hand over your credit card details then as mentioned above what you’ll actually be buying into is an opportunity named Jeff’s 6 Figure Business System. Now this isn’t an entirely bad thing because the sales pitch you’re given on the Secret Millionaire Training website does kinda fall in line with what you get with Jeff’s 6 Figure Business System – but the big problem is that there is much more of a chance of you losing money here than ever making it. You see Jeff’s system is actually what’s known as a high-ticket network marketing opportunity & it’s built around making money online. Essentially this means that it sells expensive products that teach people how to make money online, and that the primary way you make money with it is by recruiting others into it. If you’ve ever heard of the program MOBE before then basically it’s similar to that. I will admit that it’s technically legit & that if you invested a lot of money & worked extremely hard then you could probably make money with it. However investing all that money introduces a lot of risk which in my opinion is completely unnecessary since you can get started elsewhere for free. The other problem is that if you’re a newbie it’s going to likely take you a long time before you even earn enough to cover the monthly fees never mind earn enough to recoup your initial investment. Another thing I’ll admit though is that yes, as Jeff (and the Secret Millionaire Training website) claims you can earn a lot of money by selling higher-priced items, or high-ticket products as they call them… But to be honest this isn’t exactly rocket science. The problem I have with it is that I feel in this instance the products have been priced with commissions in mind, rather than being priced on the actual level of value that they provide to the customer. I mean sure, it’s Jeff’s business he can price his training at whatever he wants… But ultimately I think if you did hand over all those thousands of dollars then you’d likely be kinda disappointed at what you actually received. I feel that many of the people buying them will purely be buying them in order to unlock the potential to earn money by reselling them (in the hope that they’ll earn those big commissions). That’s just my own opinion, but that’s the same thing that was happening at Digital Altitude (another similar company) and they got forced to close down because of it since it was essentially more of a money-making scheme than anything else. What I’m saying is that you’ve just gotta really tread carefully with this sort of thing. If the websites promoting Jeff’s 6 Figure Business System were more honest about what it actually entails then I probably wouldn’t have as big a problem with the whole thing as I do now… But the income claims they make are just outrageous. And also the way they make it all sound so easy is just complete distortion of the truth. But, if you scroll down their website you will reach the income disclaimer & this is where you’ll find out it’s not all as great as what they make it seem. That’s why they keep the disclaimer in such small font & make the colour of the font almost identical to the background… Because they don’t really want you to see it. That’s a bit of a U-turn considering the whole website repeatedly promises you are going to make $2,740 per day LOL. Yep that’s right, 32.5% of active members earn less than 32.5%, despite likely having invested multiple thousands to get started with the program. On top of that take note that it does say “active”, which means there’s probably many more than have called it quits & given up. My Verdict – Is The Secret Millionaires Training System a Scam? Well I guess it’s technically not a scam since there is actually the potential opportunity to earn money with it, but you should know that it’s going to be much, much harder than you’re led to believe & that the likelihood is you’ll only end up spending more than you make. So it’s not really a scam as such but at the same time it’s not an opportunity I’m going to be recommending to you. Plus as I mentioned the Secret Millionaires Training website is actually just a sales page to get you to buy into Jeff’s system, an entirely different opportunity altogether… As far as I’m concerned trickery isn’t exactly the best way to get your customers & it just highlights what you’ll be in store for inside. Therefore overall as I say I’m not going to be recommending this program because I feel that it’s just way too risky. If you sign up to it then you’ll need to invest a lot of money & there’s no guarantee you’ll make any of it back… As you’ve seen above most people don’t.